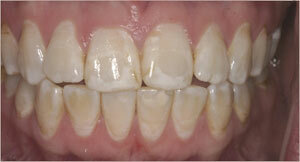 This 30-year-old was dissatisfied with the appearance of her upper front teeth. They were stained and out of proper alignment. Dr. Simon used six porcelain crowns to both create a renewed healthy appearance and achieve the proper alignment of her teeth.